Managed to finish this one before Christmas...whew! Damn, shading's hard. Anyway, hop you guys approve. Done in PhotoShop CS. This pic totally rocks !!! Except the InoCho thingie.. blah. I don't know why your art doesn't get more comments. This is really good! I think you did a great job, it looks very cool. 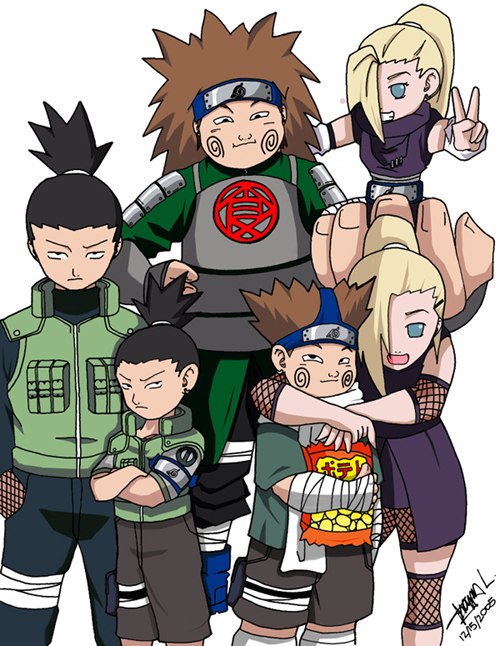 Cute pic...Shika, Ino, Choji, and parents! *Not Criticism* I went to Naruto central and um...looked at Naruto Clans, and it said that in the Naara clan, there was no one but Shika-san. Just figured I'd like to let you know. Still, super kawaii! *Glomps Shika-san* Love Shikamaru, love him!